I had a couple of motivations in doing this watercolor. The first was to try to solidify my knowledge of sparrows. When I see them as I have Chipping and White-throated Sparrows recently I try to memorize their features and then get that down in sketches(though as I mentioned in last post I'm rarely able to do any sketching with Chipping Sparrows). When I get home though and look at the sketches I often realize that something's missing or wrong. So then there's the temptation to work from a photo I've taken and do a new work that fixes the problem. I'm particularly interested in doing it in paint, mainly because it gives me a chance to add color. The other motivation is my unending attempt to master watercolor. I love the sense of light and brighntess that are in watercolors that don't follow the paint by number method and actually let the watercolor breathe. But I'm rarely satisfied with the results. Or perhaps I'm satisfied but I'm not excited. So as with field sketching or just about anything else I realize that I just need to try more. I think it's a given that you don't have success without failure. And you won't even fail if you're so scared of failure that you don't even try. My guess is that the most successful artists are the ones who just keep at it. So a couple of days ago I started this 11x14 watercolor on a Strathmore Field Sketch pad sheet. It's larger than I normally work and the reason for that is that I think it may make me less tentative. As you can probably see I also spent a lot of time sketching the bird and not very much on the stream, rocks/pebbles and leaf. 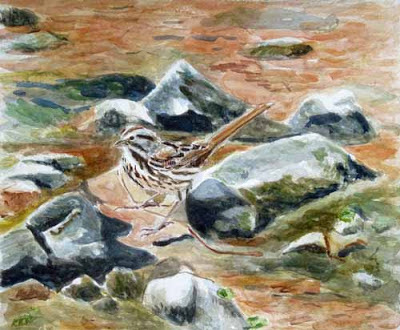 The bird itself is the ubiquitous Song Sparrow. I was going through my photos actually looking for a photo of a White-throated Sparrow to complement the sketches I'd done earlier in the week. But when I came across this handsome bird, standing so alertlyon an oak leaf in Papermill Run at Morris Arboretum I had to stop and give him a try. Time for a brief delay in art posts to show this photo of some handsome Chipping Sparrows seen at Andorra Meadows in Philadelphia today. This is done strictly for ebird so that they will stop questioning the fact that I've seen Chipping Sparrows there this winter. I really don't see Chipping Sparrows that often and have been shocked many times when I see one birding elsewhere and everyone around me looks like there's something wrong because I'm fooled by such a common bird. They are common, but only in some environments and at some times of year. I guess they are, or more likely, have been rare in Pennsylvania in the past in winter. But now they are regular at Houston Meadows and Andorra Natural Area in fall and winter. I think I've seen them every winter month for the last two years. Oddly though they're not that easy to photograph, at least not without better equipment than mine. They are relatively small and, at least in winter, fairly skittish. 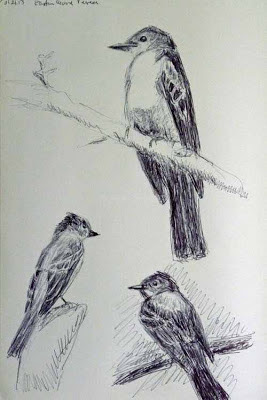 Often I see them backlit in trees, too far away to get much of a photo, or even to sketch for that matter. I'd like to sketch them but I think my only chance will be through a scope. But inevitably if I bring a scope I won't see them! Today's birds were surprisingly cooperative. As I looked at the 3 seen here I finally noticed 9 others scattered about within a few feet. But once they flew they were gone and I never saw them again. 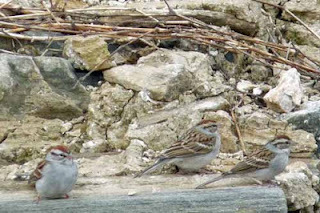 But the Chipping Sparrows weren't the big thrill of the day. Instead it was the Osprey above. It's very early for them but we are having unusually warm weather and there was a very strong wind. Perhaps he was blown north by the storm. Or so I thought for about 30 minutes. As I drove home I saw a Ring-billed Gull in flight and I remembered how long and bent their wings can be. 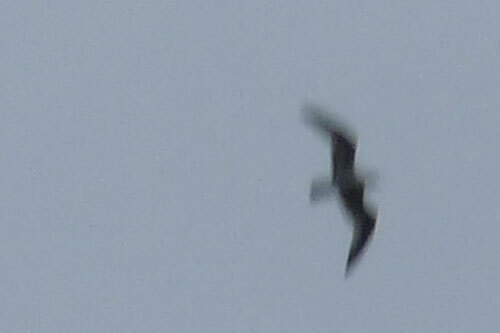 And I remembered I'd seen one much lower in the sky a few minutes before seeing my 'osprey.' Sad to say I don't think there's much doubt that the osprey was really a Ring-billed Gull!! Well maybe not all that sad. I do think I'd prefer for the seasons to stick to their normal course and not be horribly speeded up, most likely due to global warming. We opted for Houston Meadows, mainly because it's got such beautiful views and because it's slightly more likely to hold Eastern Bluebirds, Chipping Sparrows and possible rarities. Early on we saw a Northern Flicker in flgiht. Jerene thought she saw a second but couldn't confirm it.Two hours later as we backtracked over the same route and were heading for the car we saw another flicker in same area. Jerene said she thought she might have seen a second. When I checked I saw a second a bit to the right in another tree. Then I saw a third, and a fourth. As we continued to look we then spotted a fifth and a xisth! All were on trunks of two or three trees. They weren't on the ground, weren't on horizontal branches. No, every single one was on the trunk, their back to the sun. At first I thought maybe they were feeding, looking for insects in the bark. But Jerene said that they were just sitting there. She was right. I took a number of photos and each showed a bird sitting still. I can't think of anything other than that they were warming themselves up in the sun. I've never seen this before. And I've never seen so many flicker in such close proximity before. In the fall we will often see more than six in one day of birding, perhaps two to three times that. But I've never seen them altogether like this. So it seemed like a good idea to commemorate it in a watercolor. This is done on Stillman and Birn Delta paper. I've said it before but I'll say it again: this paper is ideal, at least for me, in working out ideas. It's not so cheap that it immediately buckles as soon as you put water on it. On the other hand it's not a ful fledged watercolor paper either. The good side of this is that it's not inhibiting. I worry paintings to death thinking I might ruin a good sheet of paper. With this paper I don't have that problem. It's an unusual niche but one that I find very useful. When we headed out for a walk in the snow I didn't expect to see sunbathing birds. But that's the beauty of getting out. You never know what surprises you'll find. I don't think it got much above 25 while we were out. There were few others on the trail outside of 5-6 mountain bikers. I suppose the cold might have scared some people off. But if you dress warmly winter is a great time to be out. Now that the weather has finally turned cold, that is lows in the low teens, I've wanted to see what birds are still about, especially at the Manayunk Canal. Yesterday I finally made it over for a look. 95% frozen. Perhaps more. That didn't bode well for the Green Heron that has been here throughout December and early January. I've always read that birds like Belted Kingfishers will stick around until their fishing water freezes over. Well yesterday it had. The Manayunk Canal actually starts about 1.5 miles from where I start along the Schuylkill River, a large river that doesn't often fully freeze. So there will almost always be some moving water nearby. 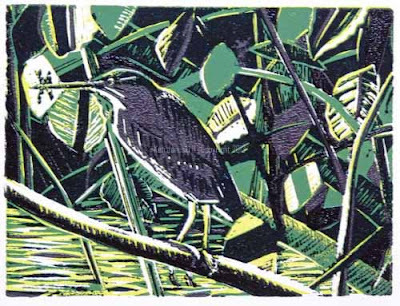 It's just that Green Herons I don't believe generally frequent such large rivers. I could be wrong on this. As I walked along even the Ring-billled Gulls and Canada Geese were frozen out. I saw five Ring-billled Gulls in the air as opposed to the 50+ I generally see loafing along or floating in the water. Same thing with the Canada Geese. I only saw one, at the very spot where the canal water joined the Schuylkill until much later when about 70 flew overhead. The few pockets of water that weren't frozen were next to outlets of running water, I assume storm sewers from the city of Philadelphia. There were about 10 of them I'd guess. That's where I found two Belted Kingfishers and a few other songbirds. Two Great Blue Herons inhabited the two slightly larger areas of moving water. But even they looked mighty cold. I don't think it was above 20 during my 90 minute walk. Finally as I walked back along the same trail I saw some movement near the very last small outlet. Sure enough the Green Heron was still here. And sure enough he's just as easily spooked as he used to be! As soon as I moved a step forward to try to get a better view for skeching he flew. Above you see my field sketches from yesterday. On the right hand page there is one attempt to put down what I saw in his brief flight before he disappeared. Beneath it a second attempt after looking at some guides at home. Also on the right page are one of the Great Blues as well as a Yellow-bellied Sapsucker. On the left page is a Brown Creeper, creeping along upside down as well as a Great Blue seen a few days ago. Both the creeper and sapsucker have been slightly modified after looking at guides and photos once I got home. This is greatly frowned upon by many wildlife artists and probably with good reason. My motivation in doing so is to correct what I had wrong, or to supplement what I didn't remember. But it's probably best to just live with what is wrong and try to remember what I missed for future drawings. In the two or three years that I've done field sketching with any regularity I've found that there is a very slow but nonetheless noticeable accumulation of knowledge and skills. There's also a greater sense of adventurousness. 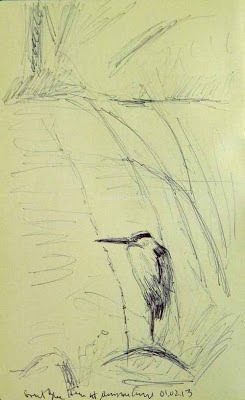 Not that long ago I never would have attempted a sketch of a fleeing Green Heron, one that I'd only seen for a split second. That is not enough time to have a conscious thought I don't think. But if I try to sketch it I do find that I do have some sort of visual image in my mind. This doesn't capture it. But it is a step. At one time I never would have a tried an upside down bird, like the creeper. But I've done a number over the years and each time it gets easier. Before you know it I'll have one that looks right!! As I think I've mentioned before I've become a big believer in field sketchin and that has been reinforced most recently by the book Bob Kuhn: Drawing on Instinct. I'd advise anyone to try it. Recently I complained about the lack of cold and snow in recent winters. Be careful what you wish for as the saying goes. We woke up to 12 degree weather this morning.That's nothing like the below zero weather I grew up with in the midwest, but it is cold! So this ballpoint pen sketch of a Great Blue Heron standing on a fallen beech along Wissahickon Creek would most likely bring back balmy recollections to the heron if he were to view this. I say this because Great Blues tend to stay here all year, no matter how cold. Though I haven't seen any during the recent cold spell I have a distinct mental image of them from other sightings. Their long scapular feathers seem to hang down their back and transmogrify into the nearby icicles. They fit perfectly into a frozen world, at least as it appears to us. I'm sure the herons have other thoughts. It seems inevitable that this time of year I always end up doing a number of sketches from my photos. I guess this is probably due partially to the fact that it's too cold to be outside as often as I am at other times of the year. I've also been reading a number of books about wildlife artists almost all of which mention how they based their art on field sketching. But field sketching, which I've done a bit of recently, always seems to show me how much more I have to learn about the form of birds. That in turn makes me think that I might learn more about their form from drawing from my photos. So that's the origin of the work above. 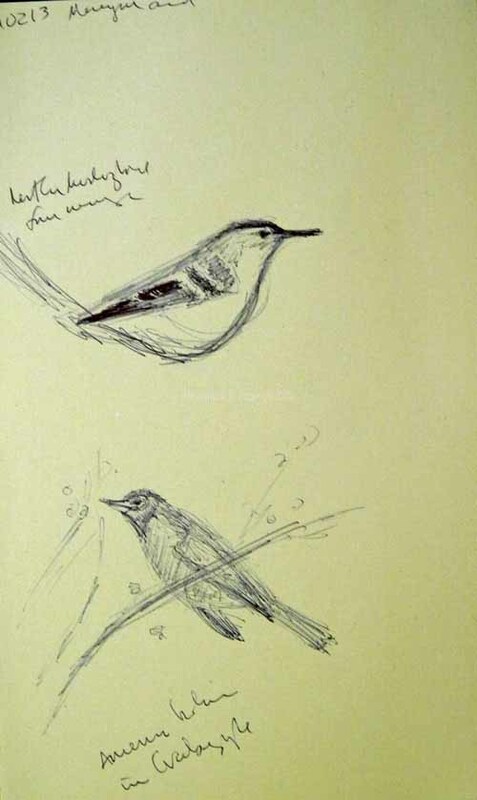 At top are a number of sketches of Eastern Wood Pewees. Beneath are some Eastern Phoebes on the left and a Blue-gray Gnatcatcher and Cedar Waxwing on the right. All of the photos struck me in some way, for instance how differently shaped the heads of the two flycatchers, Eastern Wood Pewee and Eastern Phoebe are. That's just one of the things I notice in comparing them. 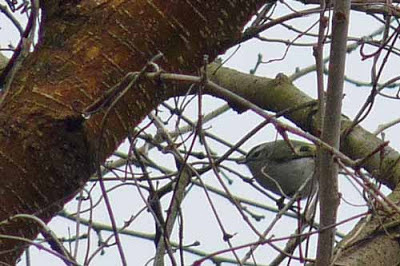 I'm almost never able to get a decent field sketch of the Blue-gray Gnatcatcher, nor really a decent photo. So this good one I took last year was a good source for understanding how their tail works. In real life it's often the only thing that I see. For the Cedar Waxwing this was an opportunity to try to get their somewhat mysterious bill, as well as the markings going from it to and around the eyes. My thought was that by trying to put these things down on paper I'd remember them better and perhaps be able to call on that knowledge next time I get an opportunity to sketch them in the field. There's also an attempt to internalize their structure so that I can abstract from them. My last Green Heron print shows I think how I like to abstract from nature. But that's much easier to do when I think that I have a solid understanding of the bird I'm abstracting. I'm starting to feel better about that. Unfortunately that's not the case with trees and shrubs. I'm afraid somewhere along the line I'm going to have to do more sketches like these of the vegetation I see! 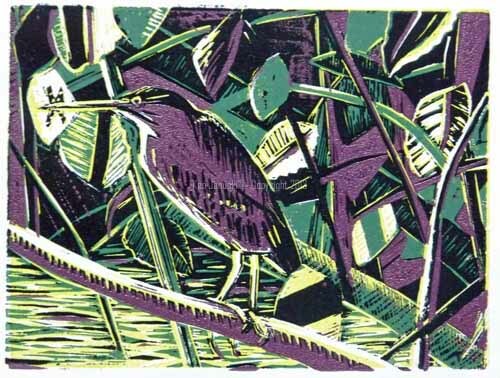 With the holidays, bird counts, scouting for bird counts and waiting on the arrival of some white ink, my poor Green Heron reduction linocut keeps being shunted off to the side. Finally today I completed an edition of 12. The print is not horribly different than the last version but I did cover some of the purplish color with black. That had always been my intention. When you're doing reduction linos you have to think in an odd way, realizing that some of the colors you see at one stage of the print have to be there at that time but will eventually be covered with another color. I did run into an unexpected problem with this. When printing by hand you rub on the paper with a baren pressuring the ink onto the paper. Normally the ink will hold the paper and prevent it from slipping as you apply pressure, especially if you hold one corner down. However today there was just too little ink to hold the paper. For the first 10 or so proofs the paper would move when I applied pressure. That cause smudges and misalignment of colors. Finally I figured out how to get it to work - the secret was great gentleness - and the print worked out as planned. It is 6x8 inches for the image alone, and 9x11 for the entire print. It is printed with Gamblin oil-based ink on Rives Lightweight printing paper. We always look forward to early January because that is the time of Philadelphia Mid-winter Bird Census. This count was begun by Keith Russell in 1987 and seems to get better each year. I do have to confess though that I miss the days of cold and snow. Recent counts have been on warmer days, as was yesterdays. It makes for easier birding, and perhaps more birds, but it sure doesn't seem like winter anymore! And speaking of winter one bird that should not be here at that time is a Green Heron, pictured at top at the Manayunk Canal, a short distance from our house. Since I report all my sightings to ebird and they sometimes want some sort of proof of unusual sightings I brought my camera along yesterday, specifically to document this Green Heron as well as any other rarities that we might find. 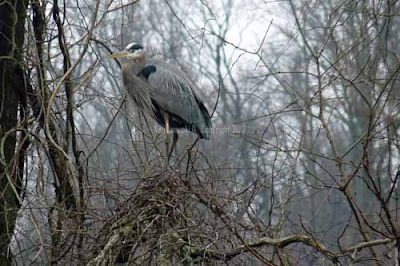 We had barely started when my wife Jerene spotted the heron just a few feet from us. So I skipped looking at him through binoculars, skipped sketching, and immediately started snapping photos. I don't at all like this manner of birding. But I was determined to document what we saw for the count. 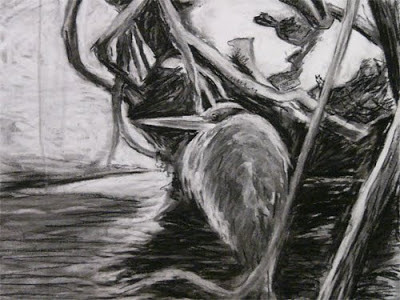 Tomorrow I'll return to sketching as a way of documentation. Along with this heron we saw three different Great Blue Herons, all in somewhat different poses. Once I got started taking photos I found it easy to continue so I also took some of the more common birds we saw. I particularly liked the pose of the Great Blue Heron perched high against a foggy backdrop. 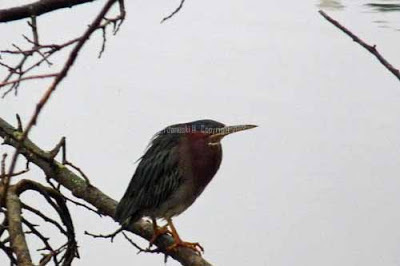 This photo is beneath the Green Heron. Still I hated to pass up the opportunity to sketch. Also I've just finished the wonderful book, Bob Kuhn - Drawing On Instinct. Kuhn was an American wildlife artist who spent many years as an illustrator then turned strictly to painting at age 50. 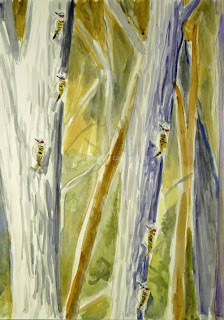 When I switched from abstraction to wildlife art it was the big game art, which he often did, coupled with slavish copying of photos, which he didn't, that really made me nervous. 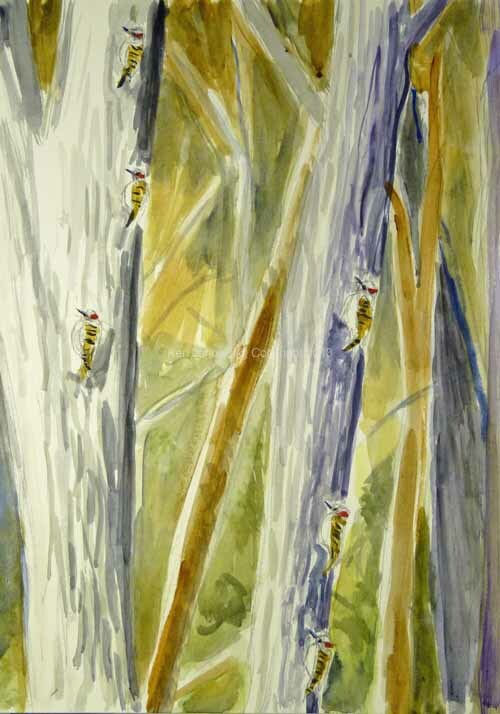 I didn't like either and it made me hesitant to call myself a 'wildlife artist'. But over the years I noticed that every time I saw a Kuhn painting it struck me as very strong, regardless of subject. This book only confirms what a talented artist he was. It confirmed that some 'wildlife artists' should really just be called 'artists.' And one thing he did all is life was draw, all the time, on any surface. I know from experience that is a good idea and this book reinforced it. So yesterday, amidst all the photos, I determined I'd do at least some sketching. 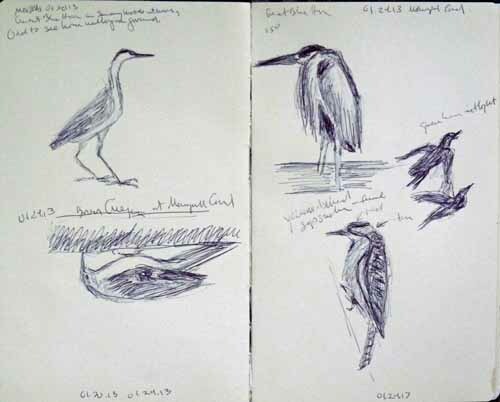 The next photo shows field sketches of the Green Heron, a Great Blue Heron, and a distant Hairy Woodpecker. He was behind one of the Great Blues so I added him as a reminder for a possible future subject. 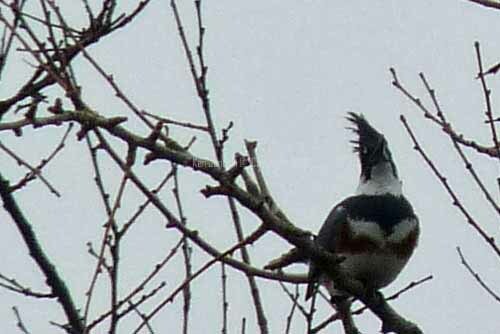 I rarely get decent photos of the very common Belted Kingfisher or of either of the kinglets. So I include photos of a female Belted Kingfisher and a Golden-crowned Kinglet. I also took some photos of Pied-billed Grebes, Common Mergansers and one Rusty Blackbird, among others. But they were too distant or too dark to be worth showing. Still I think this gives a good idea of what we saw, and should serve as proof to anyone who doubts that the Green Heron that we first saw a month or so ago is still around. I just wish that Magnolia Warbler would make a reappearance! The PMWBC link at the top includes links to previous years reports. In a month or so I'd guess it will have the full and quite enjoyable summary by Keith of all that was seen today as well as thoughts on the changes in birds that are around Philadelphia at this time of year. I always love reading it! This is a quite enjoyable project that also provides very useful information about the state of birds in Philadelphia, which for anyone who doesn't know, is often considered the origin of American birding. I know that there is a festival that goes by the name 'Cradle of Birding' at John Heinz NWR in Philadelphia. While researching that phrase just now I see that the American Birding Association has something similar this March: Cradle of American Ornithology. Finally got to printing color number four on Rives Lightweight printmaking paper today. As you can see the color changed a bit from yesterday. This print started out as an edition of 20. But as I've added colors that has declined to 10 at most. 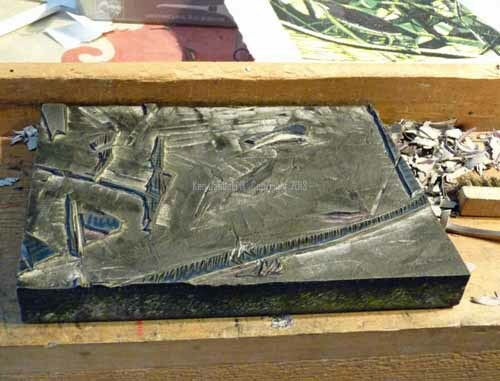 Problems of registration primarily but also of ink that is too thick or too thin cut into the number of prints good enough for an edition. Sometimes it seems like an awful lot of work. On the other hand when the edition is done and I like what I see then I see the work in a completely different light. Speaking of which, it was too late in afternoon to use natural light to take the photo above. Instead I used incandescent light and you can see both a yellow cast and the raking highlights caused by that artificial light. Perhaps tomorrow I'll take another photo in good light. One more color, or so it seems at the moment. It's hard to believe that it was less than a month ago that I posted the latest version of this, with color number three. A lack of white ink, holidays, bird censuses and other things put this print on the back burner. It seems like far longer ago than a month. 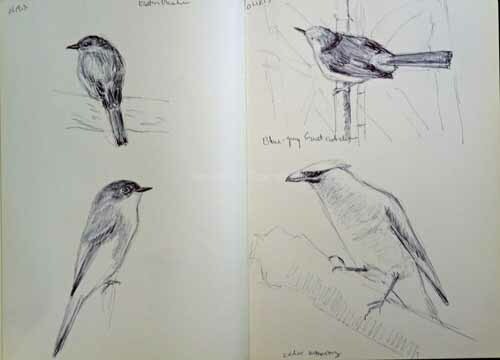 In any case the white ink arrived yesterday and most of my holiday and bird count related activities are done. So today it was time to finally revisit this. This is on copier paper.Tomorrow I'll print it on the good paper that the earlier colors were printed on. Most likely the color will change a bit. But I'm quite torn on what color to use for the maroon/violet of the heron. Additionally I'm going to next add what I hope will be the last color, black. So there are purplish areas here that I know will eventually be black. It's a bit hard to think this way at times. Still I'm almost always happy with the results. But as usual I always wonder why I put myself through so much work!!!! 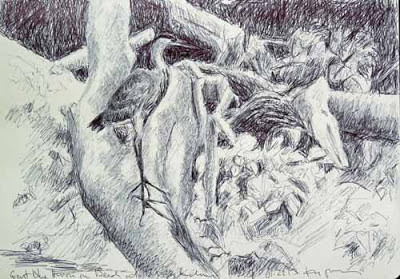 One of the things that interests me as an artist is portraying the sensations that I might experience in seeing something, with that 'something' generally being birds. Recently I saw my first Rusty Blackbirds in many years. I think they're not all that uncommon at nearby Tinicum/Heinz NWR but I just don't get there very often. When I saw two different birds on two different locations on consecutive days recently I was struck by their subtle coloring. In birding trips over the last week I've often seen a common but striking bird that also sports some beautiful browns, the Carolina Wren. Both are so striking that they plant a seed in my artistic brain that will eventually germinate into a flower, or perhaps a weed as the case may be. I have never seen them together. But both are likely to be found in swampy woods and that's in fact where I found both Rusty Blackbirds. I kept thinking that I could celebrate them by putting them both in one painting, tied together by a common environment and those browns. I'm much more familiar with Carolina Wrens than Rusty Blackbirds so the bulk of time in this painting was getting the drawing of the blackbird to seem right to me. It's based on a photo. 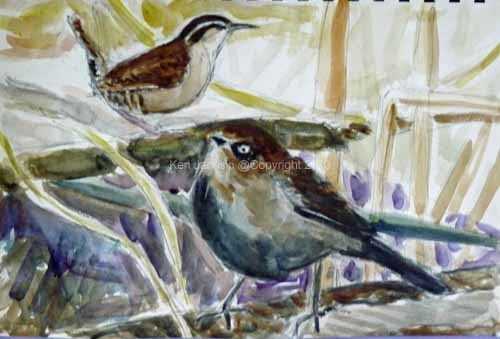 The wren is based on a drawing of the wren, drawn six hours after seeing him from memory. This is a quick watercolor, though the sketch itself took quite a while. It's 7x10 inches on Stillman & Birn Gamma sketchbook paper. I haven't used this paper in awhile but it's always useful for working through an idea. And it seems far less forbidding to me than regular watercolor paper. So I'm more adventurous I think when I use it. I'm happy with this. It could be more fully debeloped, especially in the surrounding vegetation.But I did manage to include both birds and I particularly like the Rusty Blackbird. It's not a detailed photographic replica of the birds, but far more importantly it's indicative of the excitement I felt when seeing each of the birds. It's been awhile since I've posted anything here but I've finally returned to field sketching if not yet to finishing that Green Heron reduction linocut. Oddly enough it was the search for a Green Heron that I saw at the Manayunk Canal just a few weeks ago that had me out there again today. No luck on the Green Heron but I did see a couple of Great Blue Herons as in the sketch above. I recently received a number of books as gifts, many from Langford Press in England, and two by the artist Michael Warren, American Birding Sketchbook and Images from Birding. 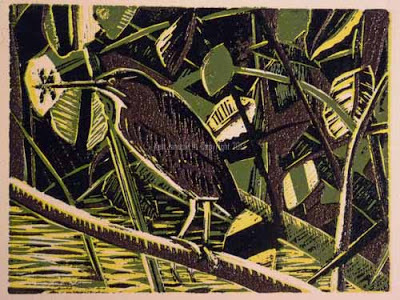 Both do an exceptional job of incorporating bird and environment, often with the birds taking up less that 25% of the composition. I love this type of bird art. Anyone who knows much about art knows that if often just doesn't look good when you plop your subject down in the middle of the canvas. I don't see much of this type of composition in bird art. Warren's books remind me of how it can be done and how exciting that can be. 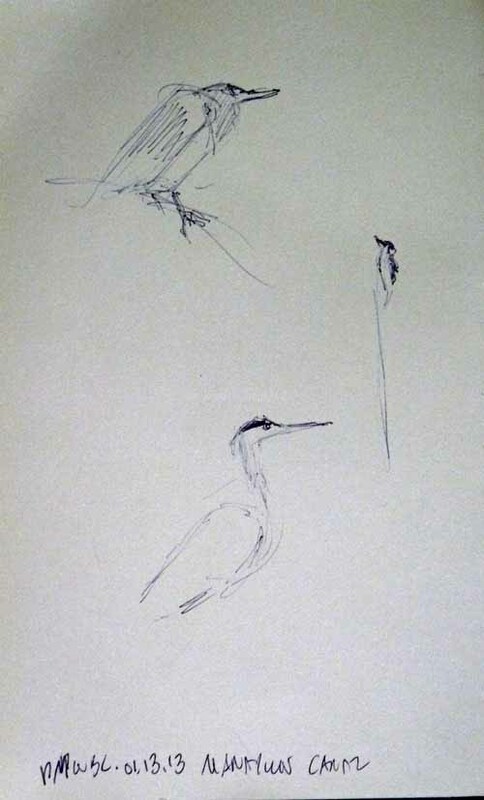 So that's why the sketch above incorporates, more or less, the environment and doesn't concentrate just on the bird. The sketches above are also from today. In the first I tried to draw from memory the Northern Mockingbird that was sitting in a berry-laden shrub about 15 feet away. But as I started to draw him he flew off. So I had to rely on my memory. As you can see I still need to to some more work on mockingbirds. As I was about to leave I saw the only American Robin of the day perched just a few feet away in a crabapple. I think he must have been hungry enough that I wasn't threatening to him. So I did this quick sketch of him in the crabapple. Oddly enough it looks almost identical to a sketch I did a number of years ago from photos of a robin in our own crabapple.